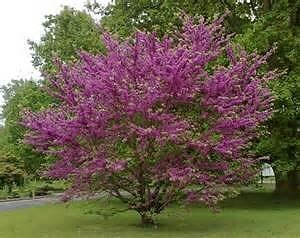 Cercis siliquastrum is a bushy, deciduous small tree which produces its bloom straight from the trunk and stems. The rosy-lilac, pea-like flowers cover the wood in May, producing a stunning floral display that is quite uncharacteristic of a tree. Following the flowers, the bright green, almost heart shaped leaves are developed on the Judas tree, later accompanied by dark purple tinted seed pods in July.